You know what yesterday* was, right? International Star Wars Day. "May the Fourth be with you" and all that. It's an actual thing, didn't you know? We have a bit of a Star Wars mad population, along with screeds of Jedi regalia and leftover party bits. 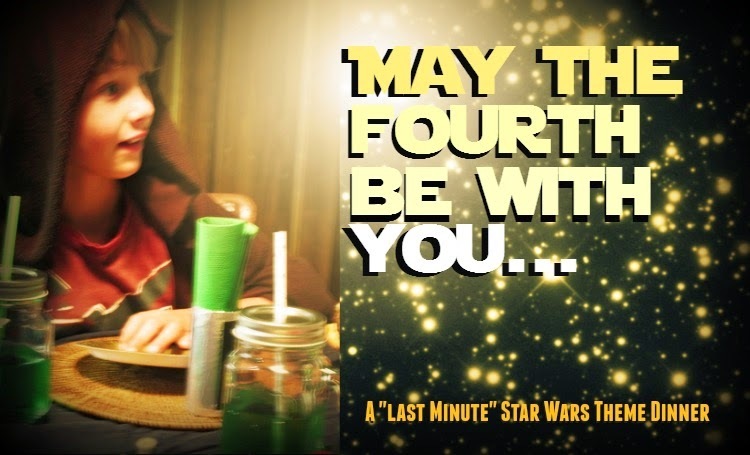 It's been AGES since we've done a theme dinner, so I impulsively announced at breakfast that we'd be having a Star Wars theme dinner tonight in honour of May the Fourth. Woop. Excitement all round. Of course, I forgot all about it and did nothing towards it as the day rolled on - and then the kids came home and the little guy was all, "Yay it's our Star Wars dinner tonight!" and I went, "oh bugger". So I did what every last-minute-Larry does who has promised her kids something and doesn't want to be the party pooper: I fell back on the quick and easy options. I dug out the light saber napkin rings I stashed last year from our Star Wars Party Just Because; I spread the table with a navy blue sheet and put Mr G's vintage Star Wars pillowcase in the middle. I dug out some gold paper plates left over from some other party. 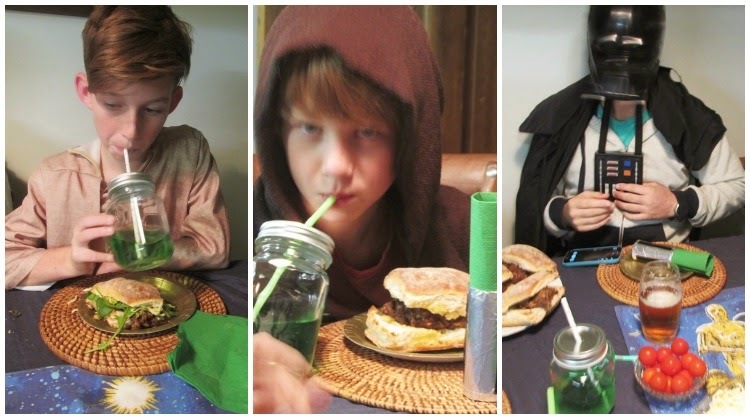 I whipped up a jug of cheats Yoda Soda (apple juice with soda water and a few drops of green food colouring) and announced that Han Burgers were on the menu. Easy peasy! 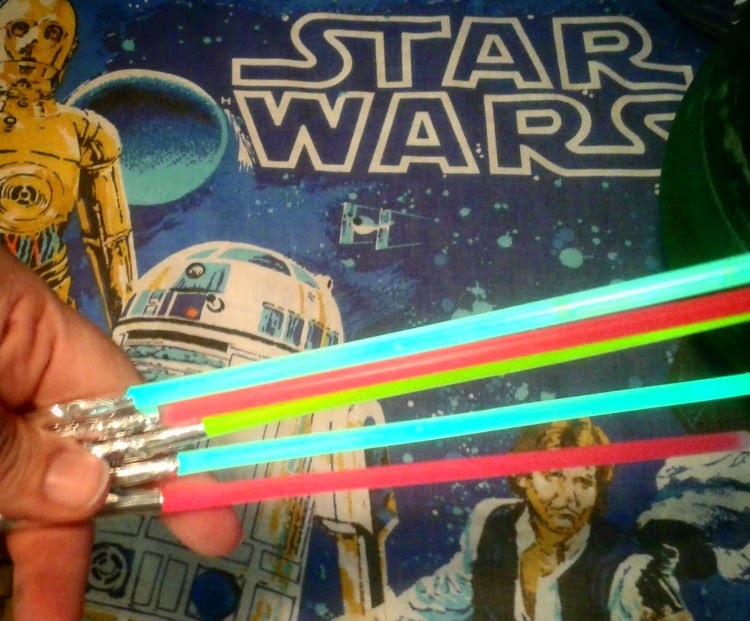 Glow sticks with a strip of silver sticky tape wrapped around one end to form a handle. Ah yes, there's nothing like a bit of last minute theme dinner fun (and on a school night too). I think I started working on this at around 5 o'clock. 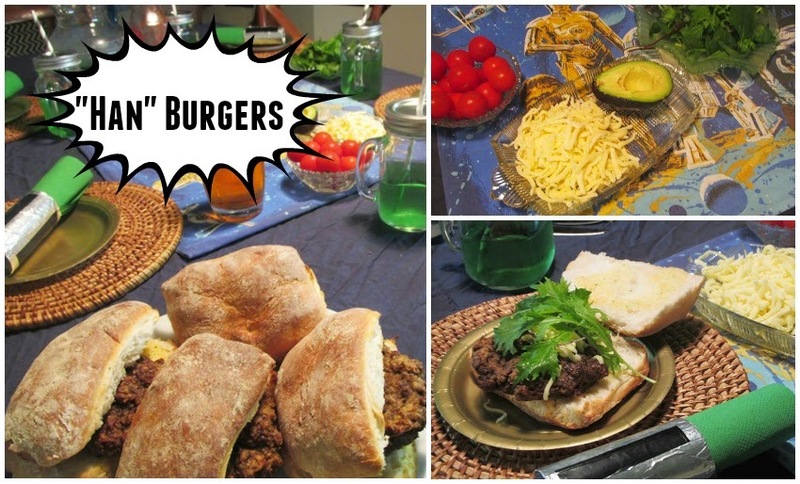 Laid the table, made the burger patties, mixed the drink, turned glow sticks into light sabers. Then told everyone to quickly find a costume and get up to the table at around 6pm. That's all the time it took to pull this off. It was a bit of impromptu easy dinner fun, just because I felt like we needed something to give us a boost. Any excuse, right? It's been too long. 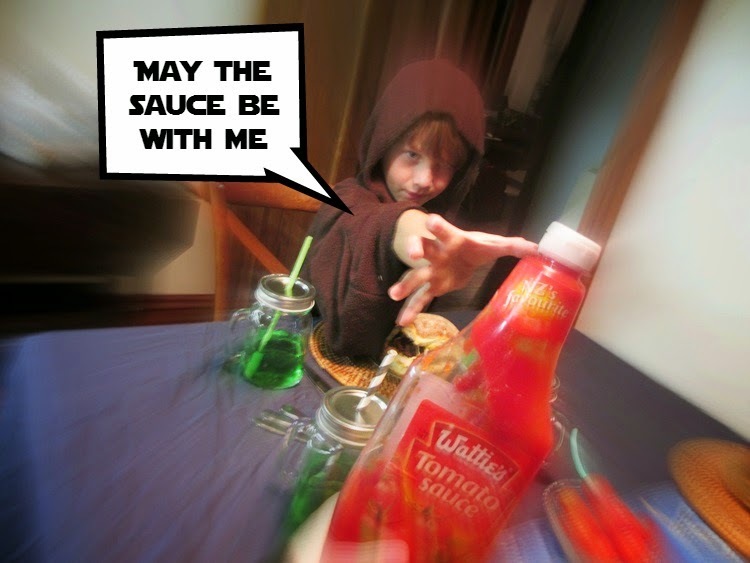 So for all my Northern Hemisphere readers who are still in the middle of May the Fourth - why not take a leaf from our book and StarWars-ify tonight's dinner? It's super easy. And lots of fun. P.S. My (proper) Yoda Soda recipe was featured today on a Canadian website called The Loop who have done a roundup of Star Wars themed food. 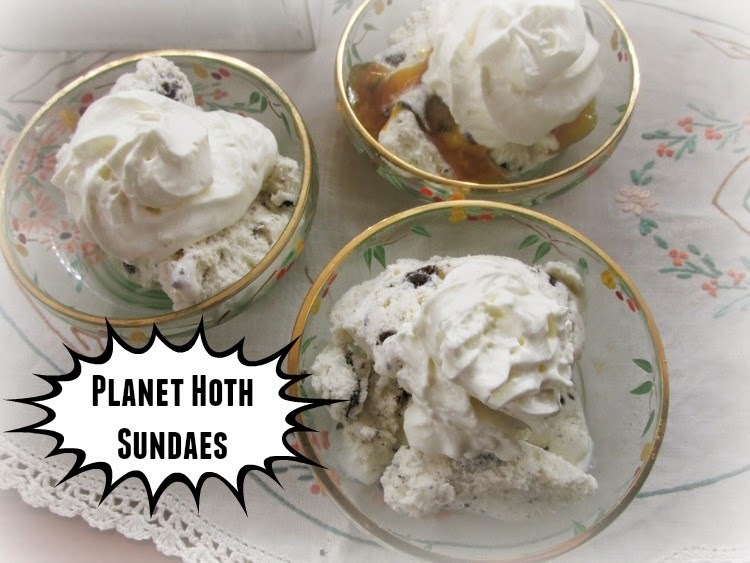 Check out all the edible Star Wars coolness here.